The Dutch bought coffee to the Indonesian islands. At one stage it was very sought after, especially the coffees shipped from Java. A lot of the best coffees where destroyed in the coffee rust epidemic in the late 1800’s and now 70 percent of Indonesian coffee is Robusta. There are still a collection of Arabica farms, and the most popular Quaffee has sold is the Mandheling. 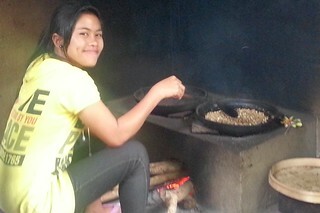 My sister was recently travelling there and was lucky enough to see some traditional open pan roasting. She sent us the pictures and thought perhaps this would be interesting. The coffee is roasted and “ground” the way it was traditional done, and is still done in many places in the world, especially the cradle of coffee Ethiopia. 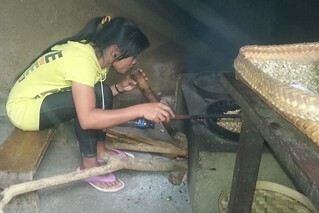 Here a lady is roasting here is using a fire and open pan. These to pictures show you her roasting on the open pan, then increasing the heat by blowing on the fire. 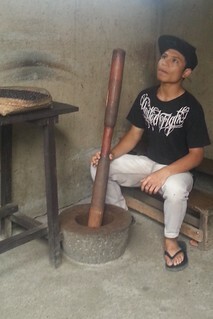 Once the coffee is roasted it has to be “ground” this is the method that has been used for hundreds of years. A standard method of crushing the beans so that when added to liquid it can expose the coffee.